I wanted to do something beautiful with those rosemary branches. That’s pretty much all the commentary this gets, because that was the entire inspiration for this meal. This recipe is truly mine – I’ve made jewelled pilafs to a number of recipes, but this isn’t any of them, and marinades are something I tend to improvise. I had to make an effort to measure things. Depending on the size of your dish, you may need to use more or less marinade – just keep the proportions about the same and you’ll be fine. Chop the chicken into cubes (ish) of about 2cm. Mix the oil, lemon juice, white wine, vinegar, and garlic in a glass or ceramic bowl until emulsified. 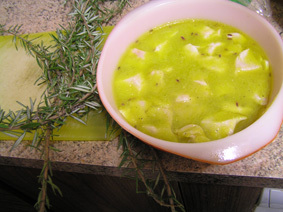 Throw in the chicken, cover, and leave to marinate for at least three hours or overnight. Thread your marinated chicken onto your rosemary branches, and trim the skewers to a length which will not result in them catching fire on the grill. Sensible people remove the rosemary leaves first, but I am not sensible people. 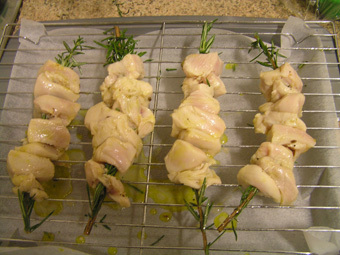 Besides, after 24 hours of marinating, the chicken went onto the rosemary skewers with no trouble. If you have time, it’s nice to leave them like that for an hour or so, to infuse with rosemary flavour, but if you don’t, that’s fine too. I didn’t. Grill until done (it took about 20 minutes on our grill), turning and basting occasionally with the marinade. You want it to be tender but with just a few browned bits. I am overwhelmed by the cuteness of these skewers. Put the water or stock in a saucepan with the saffron and bring to a simmer. 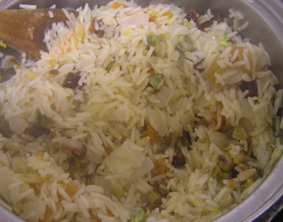 Rinse the basmati rice. Melt the butter, and cook the onion until soft. Add the rice, and stir until it’s toasty. 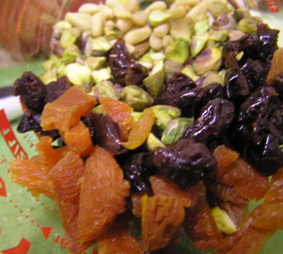 Add the white wine and stir to absorb, then add the fruit and nuts, 1/4 cup of the marinade (you don’t have to strain it) and the saffron water. Stir, bring to a boil, then cover and cook on low heat for about 10 minutes or until the rice is done. I used way too much water and had to drain the pilaf through a sieve – I believe I have the proportions right now, however. 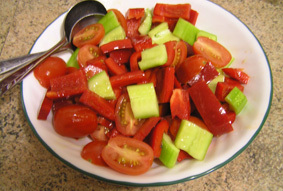 While the pilaf is cooking, peel and chop the cucumber, half the tomatoes, and chop the capsicum. Dress with oil and vinegar and set aside for a salad. Serve the chicken skewers over the rice with a dollop of yoghurt on top and the salad on the side. 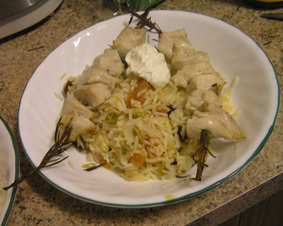 It’s very sad, but when you take the chicken off the skewers you’ll get a lot of rosemary falling into the rice. I’m afraid you’ll have to eat it. Terrible. This would work with a firm fish such as swordfish or tuna. Keep the marinating time brief, however – half an hour to an hour is generally enough. And I might keep the pilaf a bit more plain and flavour it with herbs and lemon zest. Lamb might work, too, but I think you’d have to pierce it with a skewer to get the rosemary through. You could do lovely vegetable skewers, too, with things like mushroom, red onion, eggplant, capsicum, and maybe halloumi cheese. Again, I’d go with a herby, lemony pilaf for this. You could also serve any of these skewers with pita or other flat bread and a salad, of course. Obviously, this meal is gluten free, and egg free, and can be made dairy-free by skipping the yoghurt and using oil instead of butter. It’s also fairly low GI. The vegetable skewer idea is vegan, but not really a very well-balanced meal. I’d do the vegetable skewers for a snack or entrée (that’s appetiser to you USA types) . On the other hand, the fruit and nut pilaf makes a great mealwith a tin of chickpeas stirred through it, which ups the protein significantly. It’s even better if you add a little garam masala, and maybe a carrot and a celery stick at the start. Indeed, this is one of my emergency pantry lunches, because I generally have most of those ingredients on hand. I walk past a massive rosemary bush every time I go work. I’ll have to do something like this, must taste amazing. You should! It was lovely, and looks all dinner-partyish, too. Have to try that chichen on rosemary skewers, sounds great. I hope you enjoy it! It made me very happy.